I would buy the again! The guests at the shower loved this gift. I especially loved how the knives were packaged. I did not have to do anything with them! A big hit for the rehearsal dinner! Very happy with products as favors for rehearsal dinner. 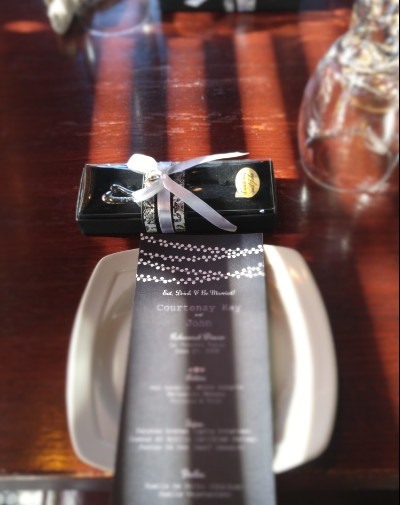 Guests loved them and fit with black & white decor for a bright venue! I was so happy and pleased when I received these for my daughters bridal shower. The heart handle shape is so appropriate for the occasion. They were sturdy, solid little spreading knives. My daughter's shower was in October 2010 and my spreader still looks brand new. I use it every time I have guests. Almost 5 years later, I still get compliments on what a great favor it was. We were so pleased ... you can't go wrong with this heart-shaped favor. The packaging went perfect with our theme too!! I am hosting a post wedding brunch and these will make a perfect favor for the occasion. The fact that they are in a box with gift giving decoration makes my life easier. I am planning to pair it with a small jar of jam and tea ( from Beau Coup also). This is the first time I have ordered from this site and I couldn't be happier. Paired it with a small dip bowl! Perfect Wedding shower favor! Yes, Spread the Love Chrome Spreader!! The Spreader was one of the "Love" gifts for a Bridal Shower! It is cute, functional, and everytime someone uses it will remind them of the fun shower and bride! The box, ribbon, and heart shaped tag is very cute. Yes, this is a wonderful prize that everyone will love! Will be used in gift basket for out of town wedding. A:This product is metal, but not stainless steel. Q:Is it possible to get these in a pair? A:Unfortunately they are sold and packaged individually. Q:How much does it weigh? Q:are you able to change the ribbon color on the spreader? A:The ribbon on this item is not able to be changed before shipping. "Spread the Love" on your wedding day with our Spread the Love Chrome Spreader with a Heart-Shaped Handle! One side of the heart-shaped handle is engraved with the phrase "Spread the Love." 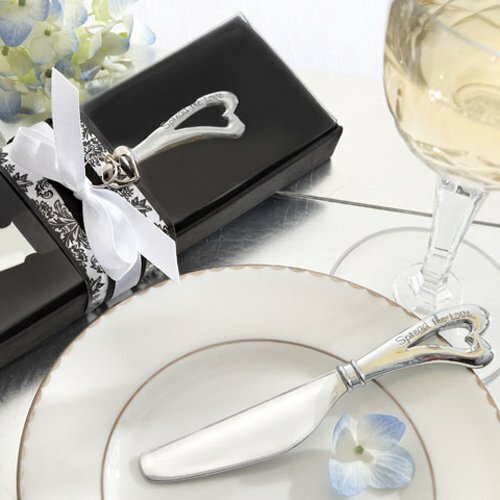 This elegant wedding favor is wrapped and ready to go home with your guests! For more spreader options, try our "olive you" olive tray and spreader or stainless steel spreader with wine cork handle.